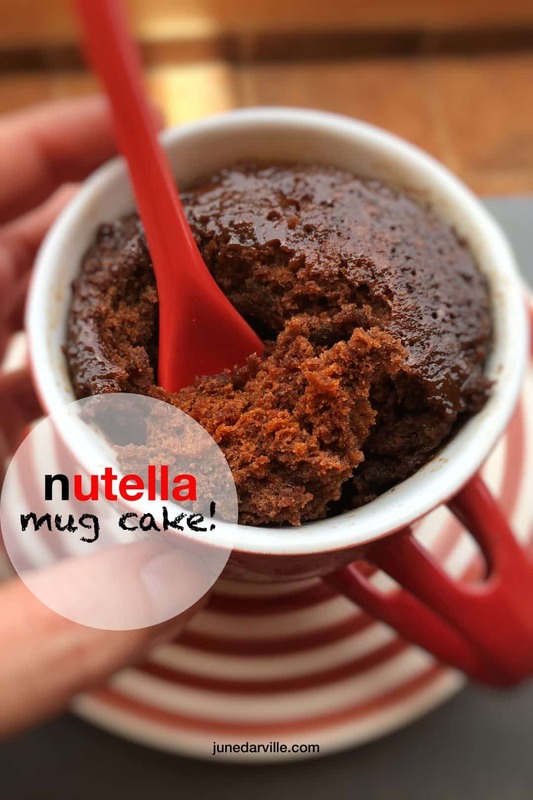 Nutella Mug Cake (3 Minutes in the Microwave!) | Simple. Tasty. Good. First time ever for me to make a mug cake. It turned out to be a Nutella mug cake! This microwave cake recipe was so much fun to make! And it is so fast because it’s ready in a blink of an eye! Seriously, if you need a last minute dessert or you crave a hot chocolate snack. This is it. This is the one then. Do you like Nutella recipes? Well sit back and relax then because that large jar of Nutella chocolate spread I bought is far from finished after making this Nutella mug cake. I’ll be doing some more recipes with Nutella in the very near future. Make sure to not overfill the mugs with the Nutella chocolate batter. The uncooked cake will rise up in the mug while cooking and if there’s too much batter, half of it will run down the sides of the mug and you’ll end up with a huge mess. And an ugly looking Nutella mug cake! I filled 2 mugs about halfway and that turned out just perfect. Enjoy! Love chocolate cake? Then also take a look at my flourless chocolate cake! 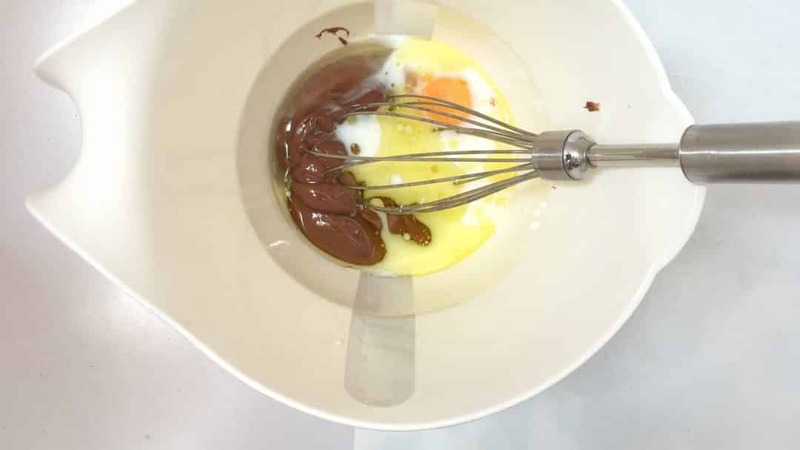 Add the whole milk, the egg, the vegetable oil and the Nutella chocolate to a high measuring cup. Whisk the ingredients well. Then also add the caster sugar and a pinch of salt. Whisk well again. Then add the sifted self-raising flour to the chocolate mixture. 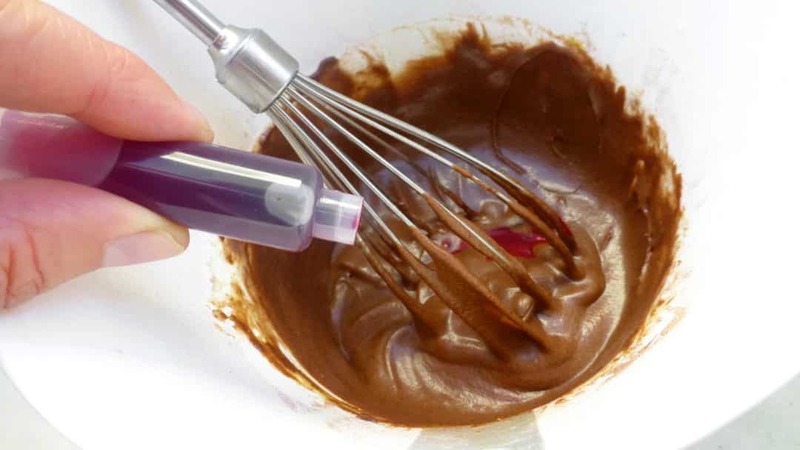 Whisk the chocolate batter until smooth. Make sure that there are no lumps in the batter. Then divide it over 2 to 3 large microwave resistant mugs or ramekins. Fill the mugs about halfway. Don’t make them too full or the chocolate batter will will run down the sides while cooking. Place one of the mugs in the microwave and turn it on high. Let the mug cake cook for 2 minutes until set. If it is not set yet, cook it for 20 seconds more. Then remove the mug and cook the other lug with chocolate batter in the microwave. Serve warm. So because the KitchenAid Stand Mixer Mini is perfect for whipping up sticky chocolate batters and such, then I will also show you how to prepare this nutella mug cake in the stand mixer! It is really simple to prepare: combine all the ingredients in the bowl of the Stand Mixer Mini and let the (pink) lady do her job and work her magic. You will end up with a perfect cake batter, no doubt. Especially if you use eggs to make a cake batter: the whites are whipped up perfectly which will make your cake in the end very light and airy. So here it is. Watch my video of how I make this chocolate nutella mug cake in my KitchenAid StandMixer Mini! 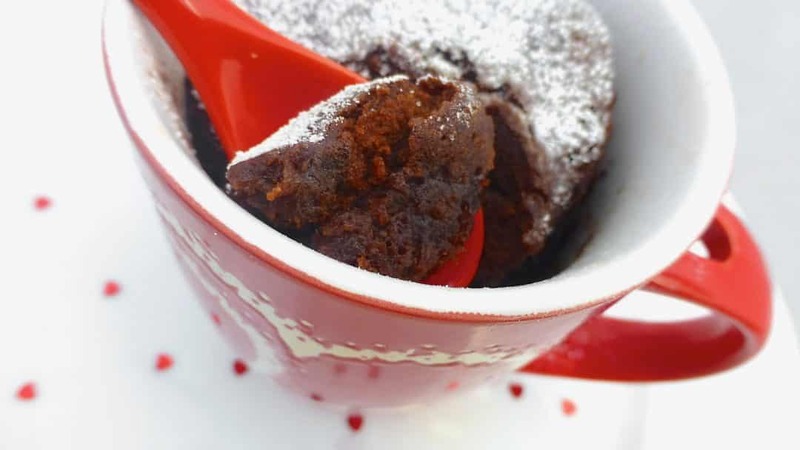 This mug cake is a great recipe for those moments where you crave something sweet but don’t really have the time to start baking a proper chocolate cake in your oven. Nothing wrong with that! It’s easy, very simple to prepare and I’m pretty sure that you have all the necessary ingredients at home all the time! 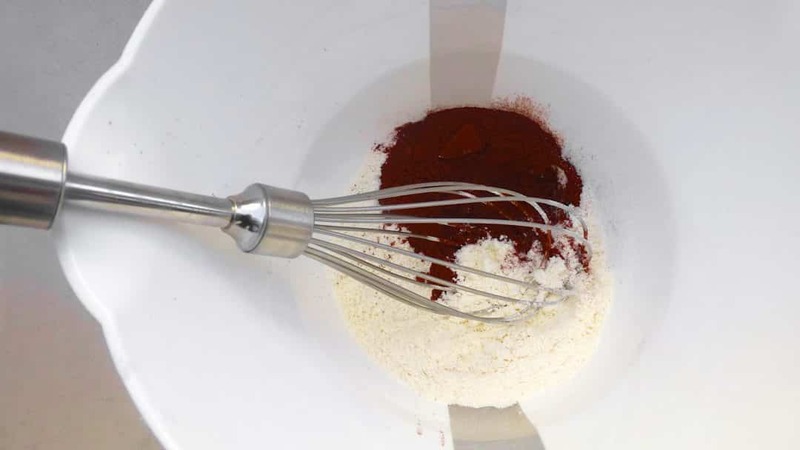 Add all the ingredients above to the bowl of the Stand Mixer Mini and season with a pinch of salt. Then attach the wire whip and lower the mixer head. Select speed 4 and mix the cake ingredients for 4 minutes until smooth. Tilt the mixer head up again and remove the wire whip. 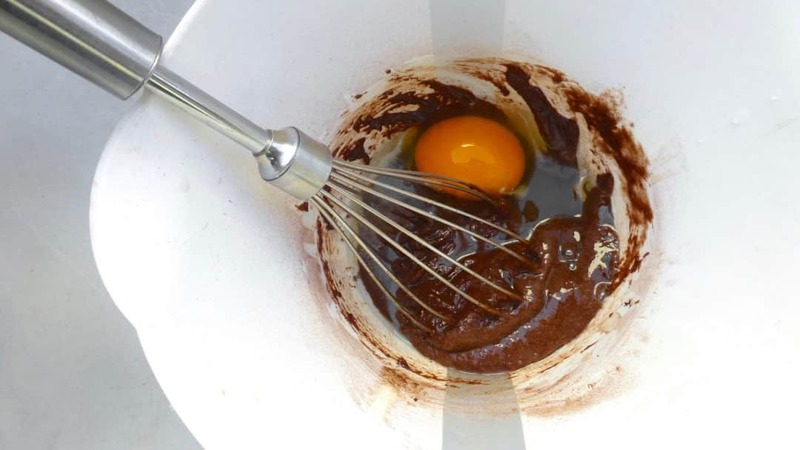 Pour the runny chocolate batter into 2 large microwave resistant mugs or ramekins. Don’t make them too full: fill the cups about halfway or the batter will raise too high while cooking and drip down the sides which will make your mug cakes look very ugly. 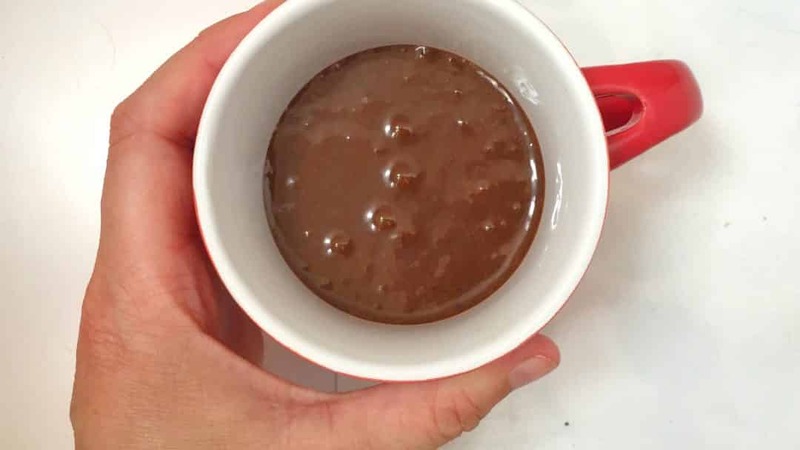 Place one mug with chocolate batter in the microwave and turn it on high. Let the mug cake cook for 2 minutes. The batter should have set. If not, cook it for 20 seconds more. Then remove the mug and cook the other one in the microwave. Serve warm. No Nutella in your fridge or pantry? 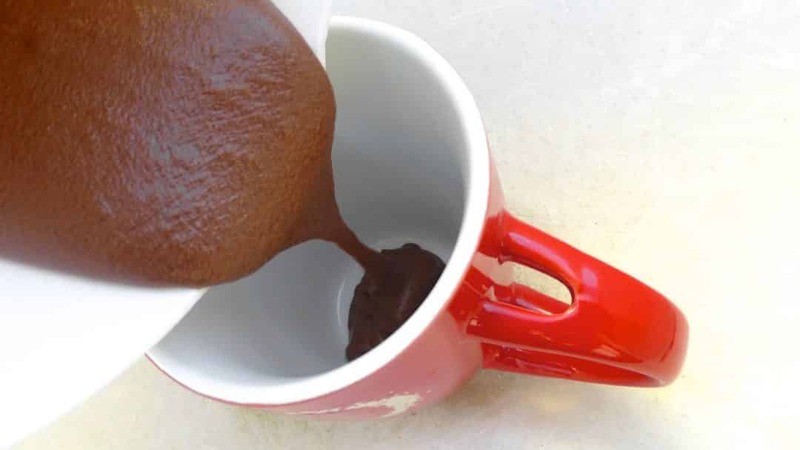 Well here is how to make this chocolate mug cake using other ingredients! This microwave chocolate cake s a quick fix if you need an instant dessert or if you suffer from a chocolatey sugar rush without making lots of pan, pots or ovens dirty. Cooking with a microwave, I’m a dummy in this field. Don’t worry, nothing I can’t handle. I liked the idea behind this cake so I put it to the test. OK, so my very first try out was horrible. Something must have gone wrong with the oil. Yuk. Mug cake number two wouldn’t rise at all. No idea why. Mug cake number three was much better because I used a little melted butter but it was kinda heavy on the stomach though. So here’s mug cake number 4: melted butter, milk and an egg. Guess that did the trick back then. 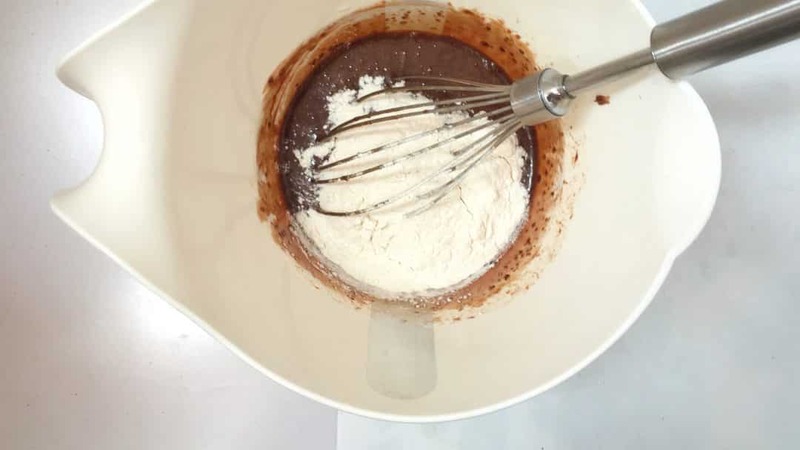 Add the flour, sugar, a pinch of salt and cacao to a measuring cup. Stir well until nicely mixed. Then add the milk and melted butter (make sure it is lukewarm and not hot anymore). Give it all a good stir for a couple of seconds until you get a thick and sticky chocolatey batter. Then add the egg. Beat the egg well into the cake batter until it becomes airy and glossy. Make sure that the batter isn’t lumpy. Add the red food coloring. 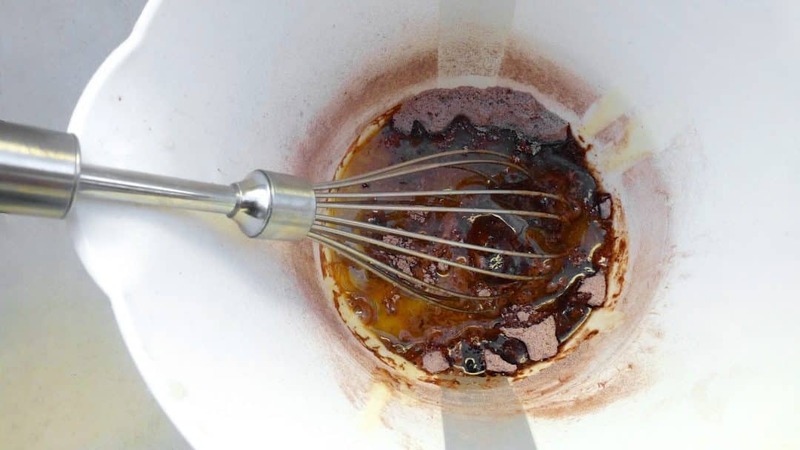 Stir the chocolate batter well because you will want to avoid any floury lumps! It should be rich, smooth but not runny at all. Pour the batter into 2 medium ceramic mugs (or 4 small ramekins) that are microwave resistant. Place the mugs in the microwave on a microwave tray (if the cakes rise over the edge and run down the sides again, it will be easier to clean afterwards). Microwave for about 1 minute and 40 seconds at 650W. Your cake might need an additional 10 seconds more or less depending on your microwave or how high or wide your mugs are. The cakes must have risen nicely and look like any other normal chocolate cake on the top. Take the chocolate cakes out and let them cool for some minutes. Serve lukewarm. Yum, a mug of hot chocolate! Who can say no to this treat? Hot chocolate is a classic winter drink but I confess that I can also enjoy a cup of this delicious chocolate milk in the middle of the summer. It makes my tummy happy! But it also helps when I’m kind of flu like and running on low energy. 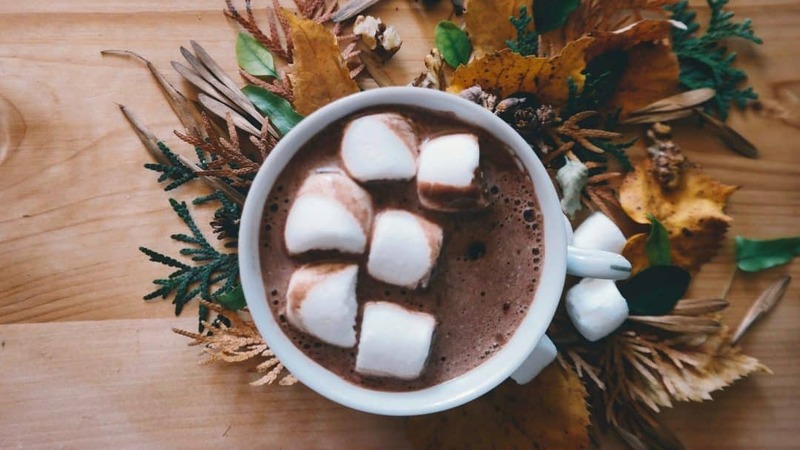 I made this rich hot chocolate and I thought that the end result was just amazing. But you can adapt it a little. Because for instance you can leave the cornstarch out if you don’t like to add this to your food. It just makes the milk extra creamy and thicker. Same for the sugar: if you think that the Nutella will be sugary enough for you, then leave it out. The cream is a must! Marshmallows, goes without saying I think. The vanilla extract also gives this rich hot chocolate a flavor boost! Enjoy this delicious chocolate treat. Yum, a mug of hot chocolate! Who can say no to this treat? Pour the milk and the cream in a medium saucepan and place it over medium heat until simmering lightly. Don’t let it boil. Once the milk and cream is hot, then add the cocoa powder and a pinch of salt. 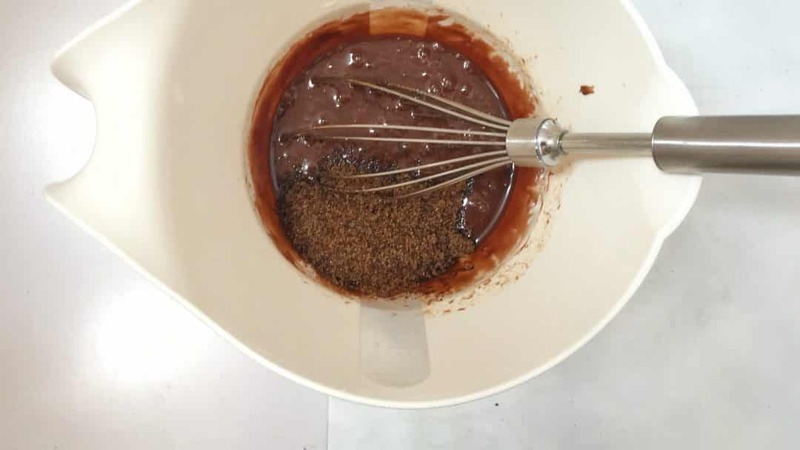 Stir well until the cocoa powder is dissolved fully. Then add 3 tablespoons of the warm cocoa milk to a small cup and add the cornstarch. Whisk well until the starch is dissolved. Check if there are no lumps. Then pour the starch mixture back in the saucepan with the rest of the warm cocoa milk and cream. Stir and add the vanilla extract, the sugar and the Nutella chocolate spread. Stir well. Turn the heat up a little and keep stirring the hot chocolate. Once it is creamy, then check the seasoning and add extra salt or sugar to taste if necessary. Take the hot chocolate off the heat and pour it into mugs. Serve hot with marshmallows if you like. I bet Nutella is the most popular breakfast spread in the world because you can find it almost everywhere. But what exactly is in it? Do you know what ingredients Nutella consists of then? Here are some of the main ingredients you can find in Nutella: fresh hazelnuts, palm oil, cocoa, milk powder sugar and artificial flavours. Nutella is manufactured by Italian company Ferrero that was first introduced in 1965. You might be familiar with Ferrero Rocher chocolate bonbons, those golden wrapped chocolate balls with crunchy hazelnuts? This company based in the Italian Piedmont region is actually a family business, run by an Italian family by the name of Ferrero. Believe it or not. Apparently Nutella was in the first place created to back up the lack of chocolate in the forties because of the Second World War. Hazelnuts grow like crazy in the Piedmont region so the family started to add hazelnuts to their batch of chocolate. Is Nutella good for you? 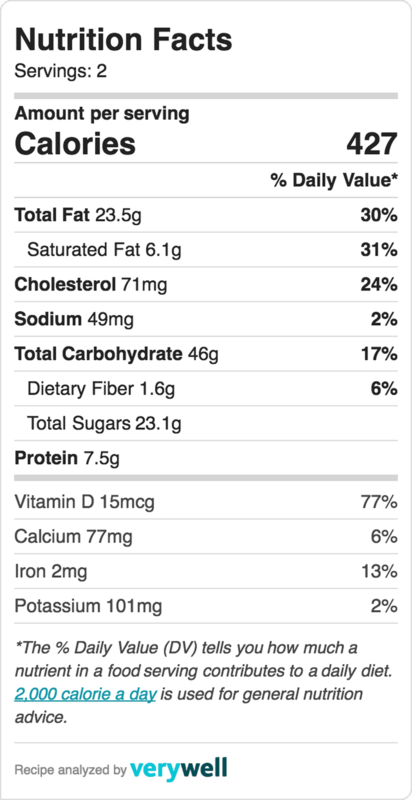 What are the health benefits of Nutella? Well if you ask me I believe it’s like with most foods basically: moderate consumption won’t harm you. The Ferrero company nevertheless lost a lawsuit in the US where Nutella was advertised as being “part of a nutritious breakfast”. Nevertheless enjoy my Nutella recipes! Wonderfull! Well done and happy new year!